13. Mario Party 3, Nintendo 64, 2000. Try as the game might, someone has to lose. And this third entry on the series' debut platform was showing its age. To be fair, many view this game as the high point of the 64-bit Party trilogy, with the ability to play two boards at once, a wider variety of mini-games, and the removal of a blister-inducing control method. But when the invitation was sent to Waluigi, and the purple-suited one RSVP’d "Yay," this version cemented its place as the least salvageable among a baker's dozen of similar contests. That, and a gameboard is named "Woody Woods." Come on, localization team. You're better than that. 12. Mario Party 5, GameCube, 2003. This sequel gets docked major points for dismissing one of Nintendo's most venerable characters from its core ranks. So long, Donkey Kong. In hindsight we now realize this was necessary to allow the simian to stretch his skills in other ways: the percussive beat-making of Donkey Konga, the combo-paradise platforming of Donkey Kong: Jungle Beat. But to have Nintendo's first and oldest recognizable character limited to his own section of the game, labeled "DK Space," smacks of ageism at best, post-millennium fear-mongering at worst. 11. Mario Party Advance, Game Boy Advance, 2005. A boardgame is meant to be played together with a group of people. The first handheld Mario Party makes this inherently difficult by way of its hardware. Instead of a single large screen, each player stares at their own system. A Monopoly board cut into four separate pieces will not have the same impact as the contiguous original. Add in the required Game Boy Advance link cables in order to hook up each system and the set-up experience leans closer to using jumper cables on four cars at once. You can always play solo against the computer; this is as ill-advised as hiring strangers to go dancing. 10. Mario Party 8, Wii, 2007. The series had just taken its first year off since 2001. Large swaths of the non-game-playing public were in maniacal pursuit to secure this small white box with its strange name and magic remote controller. Expectations were high. That this first motion-controlled Party released on my birthday only fueled any irrational anticipation. So when the game was merely competent with an overuse of fiddly arm-waving to win a spate of patience-testing challenges, the collective sigh of disappointment was heard all the way in Kyoto. The series would not be seen on a home console for five years. 9. Mario Party, Nintendo 64, 1998. The original just cracks the top ten if only due to firing the starter's pistol. 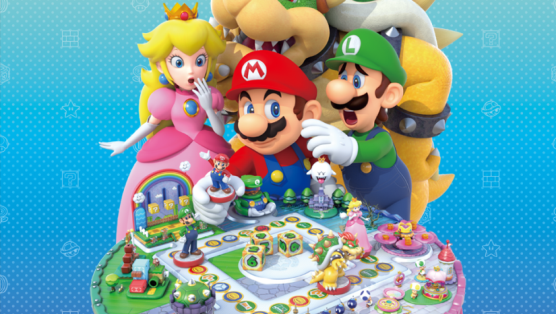 Since 1998, the Mario Party franchise has sold nearly 40 million copies. Without this first attempt at Mushroom Kingdom denizens parading around a virtual boardgame, spurred on by the bop of a Dice Block instead of nudging right on a D-Pad, none of the others would be possible. On strict merits, though, the first is a bit spare, with only six playable characters, a lack of in-game items, and poor Toad relegated to hosting duties. 8. Mario Party 4, GameCube, 2002. The fourth Party began what is known as the Saturation Age, where Nintendo and developer Hudson Soft would crank out a new Mario Party game with the feverish pace of a Madden or Call of Duty. For the first time, we saw a more vividly realized boardgame world, with the GameCube's relative power allowing a crispness and level of detail not before possible. Play enough and unlock a secret board, "Bowser's Gnarly Party," notable for its use of '90s-era lexicon and crumbling paths that reward trailblazers while penalizing those who cross last: A veiled admittance of Nintendo's failure for choosing cartridge over CD the previous generation? 6. Mario Party 7, GameCube, 2005. Long before Super Smash Bros. for Wii U brought the mayhem of eight players , to your living room, the final Mario Party on GameCube gave you and seven soon-to-be enemies the chance to smack moles, evade Cheep-Cheeps, and guess playing cards. Each duo shared a single controller; the closeness bred an intimacy and fear of sabotage never before seen in the series. It would be higher ranked, especially with mini-game titles such as "Herbicidal Maniac" and "Apes of Wrath," but as the fifth MP in four years, Party fatigue had set in. 7. Mario Party: Island Tour, 3DS, 2013. I grant this the Lucky Number 7 in my list because it is the one Mario Party game I've played with my niece and nephew. Though the ten-year-old is normally immersed in Minecraft or Five Nights at Freddy's, and the eight-year-old enjoys Frozen: Olaf's Quest a little too much, both respond enthusiastically to the simple joys found in this and every MP game: the anticipation of a dice roll's random outcome; one mad-cap quick challenge after the other; the glory of sending an opponent back ten spaces and stealing their coins. Bonus Points for the only non-system-name subtitle of the lot. 5. Mario Party 10, Wii U, 2015. Top Five by dint of being the fresh new face. Due to its longevity being impossible to judge, it remains an anomaly, an unplaceable stallion still neighing and wheezing behind the starting gate. The tenth console game might be the largest departure yet: Nintendo's Amiibo figurines unlock unique stages and are represented in-game as physical pieces moving across the board, a lovely touch. And the Wii U GamePad opens up a new mode where you control Bowser wreaking havoc on the other players. This may be the closest we get to a Dungeon Master scenario on the system. The worry is that even a smart evolution won't help a game that is becoming brittle in its long-standing adherence to a winning, if staid, formula. 3. Mario Party DS, Nintendo DS, 2007. As the first on-the-go Party with the ability to connect players wirelessly, the DS version works surprisingly well. "Works surprisingly well" does not sound like the kind of hyperbolic enthusiasm one would expect for the third best entry in a franchise spanning nearly two decades. But here's the thing: With over 100 million DS systems in the world today, and the fifty million 3DS systems that can also play DS games, Mario Party DS is the version with the largest possible population of players. And since it allows for Download Play, you only need one copy of the game. Also, the story might be the series' most bonkers, where Mario and the gang become miniaturized like in Honey, I Shrunk the Kids. 2. Mario Party 6, GameCube, 2004. The sixth Party arrived none too soon. We were entering an era of unprecedented malaise and misguided energies. The GameCube was on track to become the worst-selling Nintendo home console. Weeks prior to Mario Party 6's launch, a presidential campaign ended in stifling, tragic fashion. Too many people forgot to floss. Shrek 2 was the highest-grossing movie of the year. Nothing made sense. Dropped into this dire swamp was a Mario Party like the rest of them with one gleaming addition: It came packaged with microphone. You could shout and say colors and breathe heavily into this slim cylinder of plastic and it felt like, finally, after much heartache and confusion and that dull throb of unknowable terror, someone was listening. You can also unlock Toadette! 1. Mario Party 2, Nintendo 64, 1999. And the all-time objectively best Mario Party in the franchise's long, storied history is its first sequel. As the schoolyard rhyme tells us, "Second is the best." But the main reason this edition triumphs over all those that came after, even when newer versions sported more modes, more items and more mini-games? You wear costumes. And they are adorable. Each character dresses up according to the gameboard's theme. Have you seen Yoshi dressed as a pirate? Princess Peach as an astronaut? Donkey Kong as a cowboy? You will if you play Mario Party 2. Nintendo even recognized the importance of this version over its other N64 counterparts by releasing only Mario Party 2 on the Wii's Virtual Console. In truth, the boardgame take on Mario & Friends’ video adventures inspired fierce competition, manic joystick wobbling, and more than a few rulesets for when to swig the Manischewitz. This week, the tenth home iteration of the long-running series launches on Wii U. Each traffics in the same cadences: The roll of the die, the race to the finish, the non-sequitur escape from a school of Boos. If you’ve missed a Party or two (or ten), fret not: Here is the definitive ranking for all thirteen Mario Party games, based on very scientific formulae not unlike the end-game dice rolls that scoot the loser to the front of the pack at the last moment, like some virtuous deity looking out for the most fragile among us. Shalom, Mario. Of course, the best Mario Party game is likely the one you’ve played most with your friends. Or perhaps the worst Mario Party game is the one you’ve played most with your friends, because they no longer want to be your friends since that one time you overcame great odds, snatching victory from defeat with a one-in-a-million dice roll (and a well-timed prod with your elbow).